Rep. Josephson’s May 30th Newsletter: Special Session Update! I have several pieces of news to report. First, we are a week into special session and have been unsuccessful — so far — in reaching an agreement with the Senate regarding fiscal matters. A summary table of our proposed plans is shown below. Thank you for your support and your participation during this historic 2017 legislative session. A lot of important decisions were made on behalf of our state. Some of these decisions I can take pride in because I cast a vote, or helped push the bill that I knew would have a positive impact for my constituents – and all Alaskans. Juneau – Today, the Alaska House of Representatives approved legislation to prohibit wolf hunting and trapping in two areas adjacent to Denali National Park and Preserve. 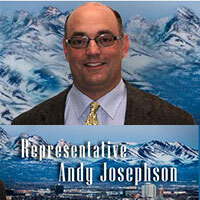 House Bill 105, sponsored by Representative Andy Josephson (D-Anchorage), seeks to ensure healthy wolf populations so that park visitors can see wolves in the wild.